Stuck in Accessing Nested Arrays? hi again! stuck in this excercise and i was wondering if someone could give me a hint of how to solve this? anyone that could please give me a hint? Hi Brian, Try to read the question again very carefully. if you are still stuck look at the example in the previous challenge. The clue is the answer to your previous challenge. Clue: The answer follows the same format as in the example. 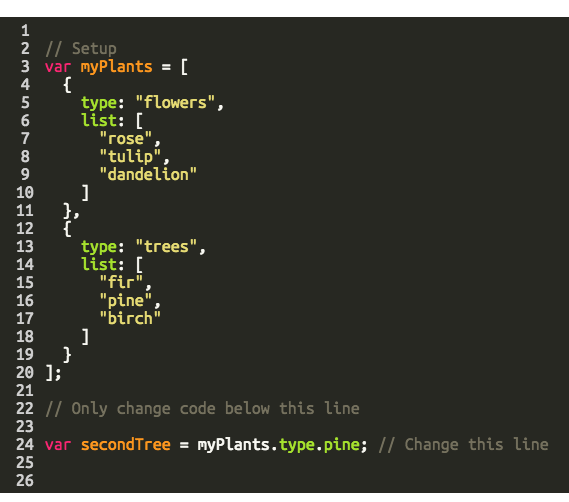 if we wanted a individual item from list rather than an array returned we have to access it and as its a array we use array notation again eg [num] eg myPlants.list … gives us tulip. think i gave you enough there to sort out this problem … also later on doing projects like weather app and wikipedia and others require accessing objects with arrays containing objects containg arrays so getting a good understanding of accessing these and pulling information out is very important so practice practice till you are very comfortable doing it . thank you! I managed to finally solve it! Thanks John for your very clear and logical explanation. I cracked it!! Prior to coming across you, I spent 1.5 hours trying to work this one out! !